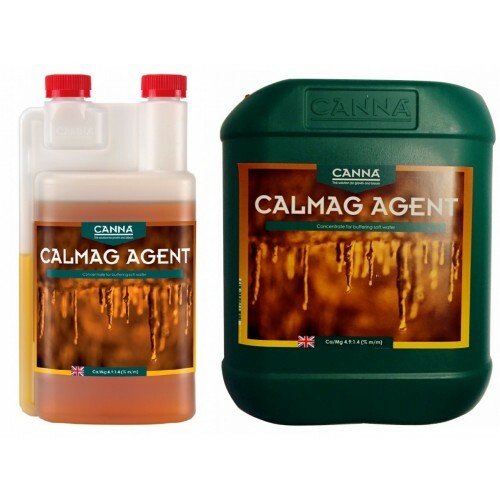 Canna Calmag Agent has been developed to to increase the EC of soft water. If you live in a soft water area, or use RO water then this product is great for "hardening" your water to aid the growth of robust, healthy plants. Canna Calmag Agent can be used to raise the background EC of soft water or reverse osmosis (RO) water up to a level of 0.4. The EC of the water can easily be tested by you by using an Essentials Digital EC Meter or a Bluelab Truncheon. This product is a highly concentrated formula and should be used at a ratio of 1ml per litre of water. Using Canna Calmag Agent helps you to manage your nutrient solution by balancing EC levels to optimum creating the perfect environment for stong plant development, high nutrient absorption rates enhancing fruits and flowering production.